For other pages with the name Blade, see Blade (disambiguation). Flare Blade in Super Smash Bros. for Wii U.
Flare Blade (エクスプロージョン, Explosion) is Roy and Chrom's neutral special move, derived from the Melee iteration of Marth's Shield Breaker. It is known for being one of the few moves capable of dealing a one-hit KO in the Smash Bros. series. The user swings his sword up and over his head to charge up the attack, then on release, slams it into the ground in front of him to create a large, powerful explosion. Fully charged Flare Blade in Melee. Flare Blade shares the same arcing animation to Marth's Shield Breaker. However, Flare Blade can be charged significantly longer, which deals more damage and knockback. The overhead slash will only produce a damaging flame-effect explosion if the attack connects with an opponent or the move is charged all the way, which hinders its hitbox. Flare Blade can be charged for up to five seconds by holding the special button, growing stronger the longer Roy holds it in position, and it can be launched at any time during the charge. The move will be automatically launched if charged for the full five seconds. A fully charged Flare Blade inflicts an explosion that deals 50% damage and devastating knockback, enough to one-hit KO all characters on any normal-sized stage (on large and/or irregular stages such as Temple, the move may not always KO), thus making a fully charged Flare Blade easily both the highest-damaging and farthest-launching neutral special in Melee. Roy suffers 10% in recoil damage from the use of a fully charged Flare Blade, regardless of whether it hits a target or not. The move retains its original arcing animation from Melee whereas Marth's Shield Breaker has been changed to a thrust. It also retains its chargeability, although it now produces a damaging explosion hitbox regardless of what stage it has charged to, which increases in size as Roy charges the move, escalating from a small explosion to a huge fiery blast. It has increased startup as a tradeoff for the larger hitbox, as well as an animation where Roy lifts his sword along his left before retuning to neutral position; this part of the attack can be interrupted very soon, making the move very difficult to punish especially when spaced properly. Fully charged, the move is still capable of OHKO-ing, although each stage of the move now deals much more knockback and is able to KO at low percents if charged up slightly: a second of charging is enough to KO middleweights at the sides of the stage at 95%, and a three-second charge is able to KO at 45% in the middle of the stage, making a connected Flare Blade an incredibly strong move that is useful for punishing bad ledge get-up options. Flare Blade returns as Roy's neutral special move. It appears relatively unchanged, but Roy can now turn around freely during the charge process, allowing more flexibility to the move. Chrom, Roy's Echo Fighter, shares the same neutral special. Chrom's Flare Blade is a yellow wind/slash shockwave, without any elemental effect associated to it. The particles emitted during the move's charge-up are also different, with Falchion slowly glowing with a blue sparkle from the hilt to the tip. 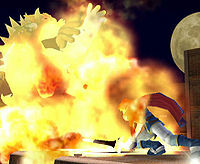 Additionally, dust and debris appear around Chrom while he is charging the move, and the explosion kicks up a considerable amount of rubble. "Swing the sword for a powerful explosion. Deals more damage but hurts the user when fully charged." Like the other DLC characters, Roy lacks custom move variations. In Fire Emblem: The Binding Blade, the titular Binding Blade wielded by Roy is capable of channeling fire when Roy attacks from afar or scores a critical hit. Roy's movements and sword arc when using Flare Blade are also based on his critical while wielding the Binding Blade. Chrom has no abilities in any Fire Emblem game that resemble his version of the Flare Blade move. 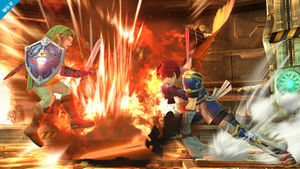 Roy using Flare Blade as shown by a Skill Preview in Ultimate. Chrom using Flare Blade as shown by a Skill Preview in Ultimate. In Brawl, Ike's Eruption is very similar to this attack, only with differences in hit effects. If Roy releases Flare Blade 1 frame before it is fully charged, it will deal 41% damage rather than 50% (45% in Smash 4), but the 41%/45% Flare Blade actually has greater knockback value than the fully charged 50% Flare Blade at high percentages (120% or higher). This is most often used during the Home-Run Contest. In the case of Smash 4, the knockback growth value is significantly higher uncharged [KBG: 110] than fully charged [KBG: 83/70]. This situation pertaining to knockback is somewhat similar to Ike's Eruption and Corrin's Dragon Fang Shot. This page was last edited on April 23, 2019, at 08:52.